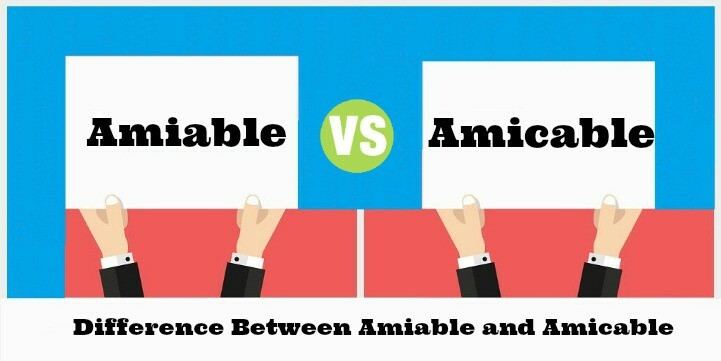 Summary: Difference Between Amiable and Amicable is that Both the words are in positive sense ‘Amiable’ is used to describe a characteristics or trait of a person while ‘Amicable’ is used to describe an incident, situation and the relations between people. Definition:- ‘Amiable’ is used to describe a characteristics or trait of a person. Meaning:- Friendly, Pleasant-mannered, Good natured. My friend Johnny is an amiable person. Malthus was amiable, weak and dependent on those about him. It is good to work with him, he is an amiable and amusing fellow. Definition:- ‘Amicable’ is used to describe an incident, situation and the relations between people. Meaning:- Peaceful, Civil, Courteous, Polite. They participated in the debate competition in an amicable way. All countries should settle their disputes amicably. His aunt and uncle had their amicable divorce.